A few weeks ago we talked about kitchen backsplashes and it was among the most popular posts we've ever had. I'd like to continue the kitchen conversation in today's post. I am NOT an expert on stone but I've learned a bit through experience and research and that is the basis for the following information. I also know from conversation with people who have direct experience with the materials discussed and from professionals in the field that there is no one size fits all solution and that a lot of it is subjective. This post aims to mostly look at basic facts and distinctions and are supported anecdotally. 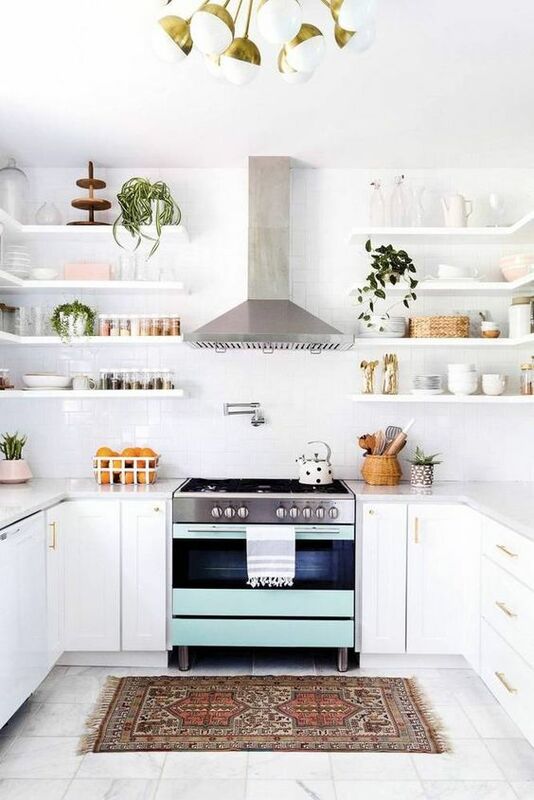 Many of us out there have coveted those gorgeous all white counters that seemingly every great kitchen on Pinterest and Instagram has. We want white or marble (or marble-looking) backdrops to our photos and the brightening effects they have on a room (and often, our moods!). When my husband and I were planning on building our home, I had started the investigation into marble vs. quartz. I've since learned ofa 3rd contender all together: porcelain. We have begun to delve more into the facts behind the great debate on whether or not real marble itself was "worth it" if another product could be more durable and/or less expensive. Let's explore those facts (and some opinions) below. We'll dispell some myths, share some info we've learned and also share our experience living with Carrara marble countertops that are probably 5-7 yrs old now. People who love the look of marble but won't buy marble. 1. They think quartz is less expensive. This is not necessarily true. The cost of any stone is contingent on the availability of that stone. In fact, in some instances, quartz varieties are more expensive than marble. In many instances, they're comparable and then others, they're less. (More on pricing near end of post). 2. They think that quartz is more durable. It is. No doubt about it. It is not, however, stain or scratch proof, but rather, just resistant. It's important to note that. (Further tips on necessary care, below). So, at the end of the day, if you boil down their thought process and final decision- these buyers ultimately want fresh bright white and durable counters more than the marble look, specifically. Engineered quartz products are a great alternative for them. (more on these below). People who cannot turn away from the beauty of marble and must have the real thing, despite the inevitable consequences. For those whose scales tip in favor of the look of marble, they are choosing to endure the wear and tear that comes with lived-in marble and/or accept what price that comes with, too. Because the question isn't whether or not you can avoid wear and tear on your marble it's just a question of when it will begin to happen. I've read food bloggers tales of being a year in to owning new marble counters and examining them to reveal very little wear and this is their endorsement of going for marble. But if there is very little wear after a year's time, they are likely hyper concerned about it and careful. Because commonly even just water is the culprit. Not just the wine or acids that are most notable. So, they are choosing the look of marble but then either accepting the inevitability of distress and not worrying about it or they worry about it quite a bit. Quartzite is a natural stone and Engineered quartz is not. Quartzite comes in various colors and is (though not always) available in a light/white marble look. It is very dense and durable so it is good in a kitchen application and is becoming more obtainable through discoveries of more quarries. The latter essentially takes actual quartzite and resin/synthetic materials and mixes them together like making a cake...you stir all the ingredients together then place into a big pan and bake. (Thanks, Julie at Mont for the helpful analogy!). The result is a very durable product that can come in lots of different colors. You need to use a cutting board with either but particularly quartzite as it is prone to scratches. quartzite is more heat resistant. Because there is essentially plastic in quartz you always want to be sure to use hot plates and pot holders underneath anything hot to avoid burning or scorching. Things like coffee, red wine, spaghetti sauce, beet juice etc. could leave a stain on an engineered countertop. You want to make sure you wipe any of those things up right away. Though there are products out there to help lift difficult stains and that plastic ingredient also makes it more durable and less susceptible to chips. Quartzite would require the sealing and resealing treatments recommended to marble. Engineered quartz does not but it does require your swift removal of the types of staining elements listed above. You essentially still need to be careful and be sure to wipe your counters. Below is Carrara marble and below that, a white engineered quartz and below that natural quartzite. There is obviously a difference, but all still lovely. Now, this is a "marble alternative" that I believe looks closer to the character and veining of actual marble. But, perhaps that is just if you prefer the Calacutta gold marble look. Just look at the two images below. The top is porcelain and below it, Calacutta Gold marble. Really quite strikingly close. Though a bathroom and not a kitchen, I found this example of porcelain (looking a lot like marble) in a bathroom display over at Mont Granite the other day. It is just a great example of what it can look like in one big slab. Gorgeous, I'd say. So, why porcelain? How does it stack up? It's a very strong and durable product. 30% stronger than granite. Due to their durability, they last a long time. They come in a lot of colors and patterns and I love the marble-like options. The new standard is 3/16ths thick and subsequently quite light in weight. Super low maintenance - These counters are heat resistant, require no sealing and are super easy to clean with just warm water and rag all that is necessary for a clean and hygienic surface. So...that's a pretty good "pros" list! Pricey. They can be pricier. But, get them priced before you rule them out. Though these are very durable and strong - they can chip and crack but it would take a lot more force and weight than natural stone for that to happen. In summary, if you love the look of marble but the durability -not the price- is your hang up, then porcelain may be a good solution for you. It is not so much the product that makes it pricey but the labor. Porcelain as counters has to be applied to a substrate because it's so thin. Also, because it's so thin, the mitering process is very slow and expensive. It's a great backsplash, flooring, wall solution but it does get a bit pricier as countertops. But still worth looking into because it is so low mainentance and beautiful-looking. But, if after all that choice weighing, you know you're still in the marble camp, then you're likely going to weigh whether or not to buy polished or honed marble. I've read that the only way to go was honed and I assumed that it was somehow more durable. Technically it is not about durability but the look. The look of being polished or matte (honed). However, the honed look can have advantages over polished. It is that matte finish that honed provides that makes people mistake it as more "durable". Water, liquids, food etc. cause etching and scratching in the stone. This is really quite unavoidable but it is far less noticeable on a matte finish than a polished one. Like others, I wanted the marble look. I didn't have to make a decision though, as the home we purchased had Carrara marble counter tops. By the time we moved in these counters were about 5-6 years old. (Now they are 6-7 yrs old). We essentially bought the house solely based on the kitchen being so close to what we wanted (after looking at dozens of bad kitchens in other homes and facing a remodel, this was a relief). We moved in and LOVED our counters. Our counters are Carerra marble and the previous owner opted for the lustre of polished over the matte honed option. These counters aren't perfect, far from it. They are etched, they are scratched they even have a few chips in certain places. A perfectionist would have a hard time with them, I suppose. We don't mind it. We got a quote in having the marble repaired and honed on site. It's not cost prohibitive and maybe it would be nice to have a "start fresh". it's on the back end of our home improvement list because it doesn't really bother us. Though, I would prefer honed. Personally, I think I am the exact right personality for marble. I love the look and am not the type of person who is precious with my belongings or space. I am the type of person who would find the romance in the wear and tear. Like, my family has lived here and this beautiful stone is the evidence. So, I am pretty confident that in a kitchen I would definitely go marble again in the future. Bathrooms, I may try quartz or porcelain just to try something else but if I found an irresistibly pretty marble slab, I might have a hard time not going marble there too. but back to our existing marble kitchen counters, I've shared images below of a new slab of Carrara, my Carrara at a glance, and some close ups of some etching. And lastly, a word on pricing. Many wholesalers and suppliers use pricing categories A-Z. A being least expensive and Z being the most. Mont, a local wholesaler I use for example, carries Marble varieties anywhere in the categories D to Z, Engineered Quartz categories range from G-V and the Quartzite ranges from S-Z. Porcelain is priced differently and again, the labor is the issue there. So, where does that leave you? I think what we've ultimately determined is that there are lots of great options and there is no one size fits all option out there. It's one part subjective, one part financial and another part honesty with yourself about the durability part of it. If you can handle the maintenance or wear and tear or if you really can't. Look at options, get pricing and then make the best decision for YOU! Thank you for stopping by and let's continue the conversation on Facebook and Instagram!